Hollywood just forgot that December started, right? Because if they didn't, and this is their honest attempt at a pre-Holiday weekend slate, then... ouch. The sole new wide release is Playing For Keeps, a title so generic that you almost certainly think you saw this several times, and possibly a couple times direct-to-video. If the over/under on how long the discussion was to name this film is larger than three minutes, take the under with everything you've got. As befitting the generic title, this romantic comedy stars Gerard Butler, the most generic leading man in Hollywood right now. Butler plays a washed up soccer player (oh, I get the title *now*) who now does promo pieces for a third-rate network, coaches his kid's junior soccer team and pines for his ex-wife, played by Jessica Biel. After getting a shot to audition for ESPN (an offer made by Catherine Zeta-Jones, who is officially in “I remember you!” territory now), he tries to reconnect with Biel while proving that he's turning into a real grown-up and oh my god I'm so uninterested in this film right now. Garnering a really impressive 0% at Rotten Tomatoes, it's possibly notable for being the first film written by So I Married An Axe Murderer scribe Robbie Fox in 18 years. I wouldn't quite create the Welcome Back party for him just yet. It's kind of difficult to find anything that audiences would even care about in this film even if it didn't look to be terrible. 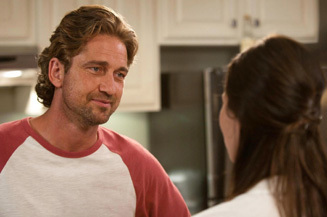 It might just be the perfect intersection of things Americans don't care about, in Gerard Butler finding love and soccer. This might be lucky to reach $4 million this weekend. So it's back to having Bond and Vampires fight it out (do *not* get any ideas, Broccoli family) for a third straight week. After a close call last week, Skyfall should finally push past Breaking Dawn Part 2 for the top spot in the box office, with around $10 million. It crossed (or will have crossed, depending on when you're reading this) the $250 million milestone on Thursday, and with any kind of holiday business at all, should get to the $300 million mark, which is an amazing leap for the series compared to recent entries. It's difficult to overstate how much of surprise it is to nearly double the domestic box office of Quantum of Solace, not to mention the serious run it's taking at a billion worldwide, something only 14 films have managed so far. One thing you can say for the Twilight series: it's consistent. After the first film felt out the market, the next four films in the series have all thrown darts at the $300 million mark. Of course, with ticket inflation, that actually represents a bit of a decrease over the last three years, but let's not be too hard on it. This time around, there seems to be a bit of a boost in the international box office, as Breaking Dawn Part is already at the $700 million worldwide figure that had become standard over the last three films. This weekend we can expect about $8 million. That might get it passed by Lincoln and/or Rise of the Guardians, which both weathered the post-Thanksgiving blahs well. Of course, there's a different standard for each, as Lincoln is about set to cross $100 million, while, the expensive Guardians is set to lose DreamWorks a lot of money. If I may make a bold suggestion to animation departments - Teddy Roosevelt: Moose Rider. You can just mail the Oscar to me, that's fine. Anyway, both of these films are riding decent to spectacular word-of-mouth and should hit around $8 million this weekend. Not too far behind will be Life of Pi, which is kind of an arthouse version of Avatar at this point – I mean, it's a movie about dude on a boat for two hours with a tiger, and it's made $50 million. That's bloody amazing. Watch for this at Oscar time, too, but give it $7 million more this frame.